It is not uncommon to go to a friend’s home, a restaurant, hotel, or even public restroom and see the use of subways tiles in many colors and designs. 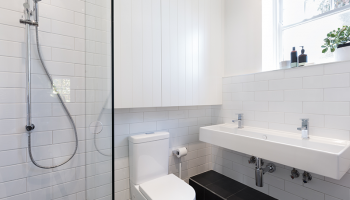 That is because subway tiles are always on trend and can be used in many ways. Thus, making them one of the most versatile ways to design your home. Because subway tiles are so versatile, they are always compatible with any style of décor or architectural style of home. For some, there is nothing more beautiful than a white kitchen. From the crisp white cabinets to the white countertops, the color appears clean and fresh. And, it provides a nice backdrop for the most used room in the home. 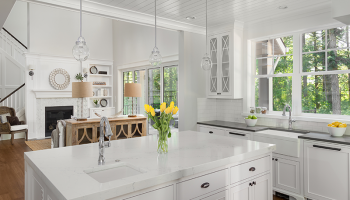 When planning a remodel or changes to your kitchen, white can be a lovely color choice. These inspiring white kitchens below can help get you started in changing the way your space looks and feels. 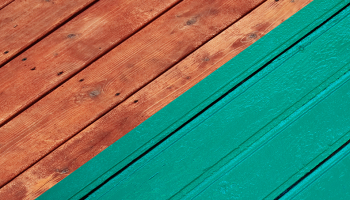 Stain and paint have many similarities, but also many differences. People often wonder which one they should use or which one is better than the other. However, the answer to that question is more complex than you think. While both yield great results, the differences between stain vs. paint will help determine which one you should use. Read further to learn more about the differences and similarities in these two color yielding substances. Once you learn more about stain vs. paint, you can decide which one is better suited for your projects. When considering the décor of the home, homeowners often decide to go with neutral colors, especially when it comes to interior doors. Nearly every room has a door for privacy, be it the standard door or pocket doors. While black and white are common interior door colors, you can choose to be bold or different and paint your doors a new color. This will give each room a new and exciting look. Sprucing up your home can be both fun and overwhelming. Whether you’re doing one room at a time or you have specific projects you’re working on, home improvement projects can take a lot of time and work. Luckily, there are several easy ways to spruce up your home, from adding a new coat of paint to changing trim styles. Here are a few creative ideas to help you choose the right trim style for your home. A kitchen island can transform the workspace of the kitchen as well as provide a design element and additional seating. The type of kitchen island you install in your home will depend on several factors, from the size of the space to your design aesthetic. Overall, you have the ability to be creative and choose something that meets your personality as well as kitchen needs. Below are a few ideas to help you decide on a kitchen island for your home. The kitchen is one of the dirtiest places in the home. We prepare several meals a day along with snacks so it is not uncommon to see crumbs on the floor or stains on the counter. Since the kitchen is considered the heart of the home, homeowners can benefit from learning a few kitchen cleaning hacks. 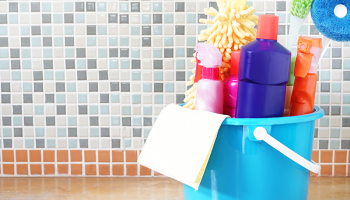 Below are a few tips to help you keep your kitchen clean, no matter how many messes you make! Many homeowners today are opting for contemporary kitchens with creative backsplashes. This small area of the kitchen can easily transform the look of the room through the use of color, unique design patterns, and atypical materials. Transform your kitchen into a unique art piece that stands out amongst the rest. Here is a list of our favorite trendy kitchen backsplashes for 2017. The kitchen sink could easily be considered the ‘center of the kitchen.’ Needless to say, it is one of the essential kitchen features that is consistently used on a daily basis. Therefore, choosing the right sink style is an important decision, as it can affect the flow of your regular kitchen activities. So, what is the right style for you? Here is a list of the five most popular kitchen sink trends for 2017.